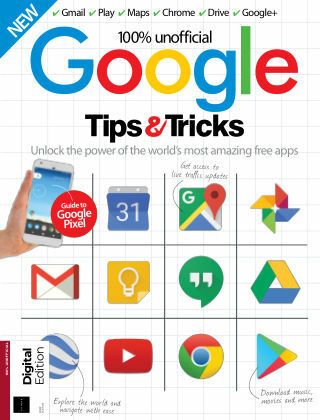 With Readly you can read Google Tips & Tricks and thousands of other magazines on your tablet and smartphone. Get access to all with just one subscription. New releases and back issues – all included. The Google team is full of surprises. Just when you think it’s gone and outdone itself, it rolls out another improvement that completely changes everything. The last biggest change was the logo, made with the ‘Alphabet’ font – it went from the old Times to a new and sleek look across the board. Now, however, Google has upped the ante, with its own mobile device, the Google Pixel, and the voice-controlled Google Home. The company that made the internet search what it is today has taken the OS it developed and produced its own hardware to go with it. Google Home will completely change how the user interacts with their gadgets and day-to-day tasks, making even the most tedious processes that little bit easier. Discover everything you need to know about what Google has to offer, from lifestyle tips to productivity tricks.